In our laboratory, the characteristics of radiation behind air shock waves have been studied systematically by using a shock tube. 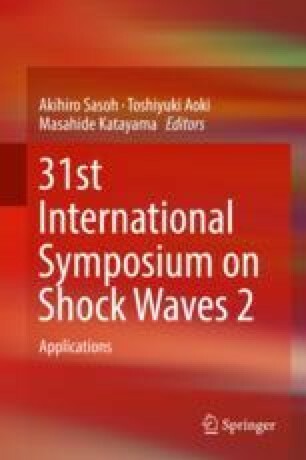 In this study, shock waves with different incident shock Mach number were produced under conditions where pressure in low-pressure chamber was kept at constant value and pressure in high-pressure chamber was increased. The radiation behind those reflected shock waves was visualized temporally and spatially by high-speed video camera. In addition, the radiation originated from the chemical species was analyzed by using narrow band-pass filters. Nitrogen and oxygen which are the main components of air were focused; therefore, narrow band-pass filters corresponding and not corresponding to these components were used in order to investigate the amount of radiation intensity. As a result, radiation intensity obtained using the narrow band-pass filters that correspond to the components is stronger than radiation intensity obtained using other filters. Thus, there is a possibility that the radiation intensity obtained using the narrow band-pass filters which correspond to the atomic lines is derived by the atomic lines itself.